So you’ve optimized Salesforce to work for your business, and you’re tracking leads from Google AdWords all the way to conversion. However, Salesforce hasn’t been syncing with AdWords to update its conversion data throughout the sales funnel…until now. Google just released an update that enables AdWords conversion imports for Salesforce. Get on board with this new integration feature and immediately gain better insights into your sales funnel. Most AdWords managers are unable to access AdWords conversion reports through Salesforce in real-time, so they’re making decisions based only on data in the AdWords interface. Unfortunately, without having this conversion data updating in Salesforce, they’re making sales funnel decisions based on incomplete, or worse, incorrect information. For example, you might know that a certain set of your paid keywords are driving most traffic to your site and converting initial leads through forms. But as your team updates their progress through Salesforce, how do you go further and figure out exactly which keyword led to an actual sale? You can’t. Or, you couldn’t. To solve that problem, the AdWords Conversion Import for Salesforce was created through a collaboration between Salesforce and Google. Released from beta, this integration saves you money and time by allowing you to see AdWords conversion data that automatically updates as you manage your leads through Salesforce. Released from beta, the integration saves money and time by allowing you to set conversions that automatically update as you manage your leads through Salesforce. Every Google AdWords click-through (aka your potential customer) is assigned a unique identifier known as a GCLID (Google Click Identifier). 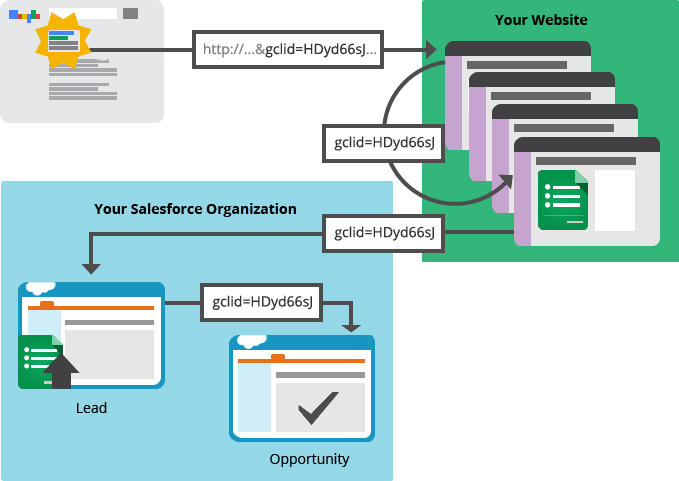 When a potential customer fills out a form on your site, Salesforce creates a profile for them, and if they arrived through AdWords, their GCLID is attached to their Salesforce profile. The GCLID can then be tracked by Salesforce at any milestone in the sales funnel that you set, so Salesforce can attribute conversions to your AdWords ad. “AdWords Conversion Import for Salesforce measures the value of your offline conversions that result from online AdWords clicks, without the need to reconcile your AdWords and customer relationship management (CRM) data manually,” Google explained in a recent AdWords blog post. To keep data current within Salesforce, AdWords will ping your Salesforce account periodically to see if there are any changes to the sales funnel. AdWords will then update those milestones as conversions. Using this data exchange between AdWords and Salesforce, companies can now see which ads and keywords led prospects to fill out a form. As those prospects progress towards conversion, Salesforce and AdWords will show which keywords have most consistently delivered customers who buy, or who get stuck at a certain point in the sales funnel and/or do not convert. The conversion import process is illustrated by the graphic below (provided by Google). Starting in the upper left-hand corner, a new click on the AdWords ad creates a unique identifier, the GCLID. This unique identifier is then entered into the website’s contact form (connected to Salesforce), which the customer fills out. As your team moves that contact down the funnel from a lead to a sales opportunity, Salesforce can track that progress and attribute it to AdWords. Then, “AdWords will regularly check your Salesforce account to see if you’ve recorded any new important milestones in your sales funnel that resulted from ad clicks. If so, AdWords will count those milestones as AdWords conversions,” according to Google’s blog post. Configure Your Salesforce Account: Add a custom field for the GCLID to your Salesforce profiles. Configure Your Website: Store the GCLID in a cookie and add it to your web-to-lead form. Configure Your AdWords Account: Link your AdWords account to your Salesforce account. Then, tell AdWords which milestones to count as conversions, and set up multiple conversion types to coordinate with milestones. Start importing - As your customers click on the ad and fill out your web form, Salesforce will track their GCLID. AdWords will be able to show a report of the conversions you captured from each ad and keyword. Although the process of setting up and running this conversion is not difficult once you know how, doing it without experience can be a bit confusing. If you need help setting up the Google AdWords Conversion Import for Salesforce, please contact us today. As a Google Partner, we’re prepared to make the integration quick and easy for you. Because every AdWords campaign captures leads that don’t turn into opportunities or sales, you're paying Google for leads that will not turn into revenue. Fortunately, the closer you can bring your sales funnel to optimal configuration, the less money you will waste. Anything that provides better insight can help you "lose less" and "win more". By closely tracking which ads and keywords are successful, you will be able to narrow keywords and ad campaigns to create the highest levels of conversions. Enabling AdWords conversion tracking in Salesforce is critical to bridging that gap. Take advantage by following leads beyond the initial touch, and pushing your team to build more intelligent sales funnels that coordinate with multiple types of conversions within AdWords. Simply set up the conversion import feature to get started! Are you an agency looking for a development partner?